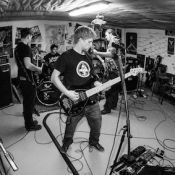 We’re about to track a new album, and we need your help for this! This project ended successfully on 29/11/2013 16:00! You’ll receive a download code for the new album, two weeks before the official release-date. You’ll receive a brand new t-shirt with the album-art, plus obviously a download code for the new album, two weeks before the official release-date. You’ll receive the finished vinyl plus obviously a download code for the new album, two weeks before the official release-date. You’ll receive one object carefully selected out of our rehearsal room, plus obviously the finished vinyl and a download code for the new album, two weeks before the official release-date. You’ll receive one cd out of the personal collection of the band member of your choice, plus obviously the finished vinyl and a download code for the new album, two weeks before the official release-date. You’ll receive an invitation to a private grill party (Food & drinks included) with the band, plus obviously the finished vinyl and a download code for the new album, two weeks before the official release-date. You’ll get to visit the band during one afternoon in the studio, plus obviously you’ll receive the finished vinyl and a download code for the new album, two weeks before the official release-date. Attention: Available until november 15! As a thank you for your participation, a minimum of two band members will deliver a full DJ-set at your private or public party, plus you’ll obviously get the finished vinyl and a download code for the new album, two weeks before the official release-date. You’ll get invited to a dinner featuring a number of courses, prepared by the band themselves – Plus obviously the finished vinyl and a download code for the new album, two weeks before the official release-date. The band will play an exclusive show in your very own living room, plus you’ll obviously get the finished vinyl and a download code for the new album, two weeks before the official release-date. You’ll get admittance to all of our upcoming shows until pretty much the end of time, plus obviously the finished vinyl and a download code for the new album, two weeks before the official release-date. The Burden Remains aus Wünnewil/CH wählen den steinigen Pfad, Thrash ist schon seit Jahren nicht mehr so spannend gewesen – Vor allem, weil schon gar niemand versucht hat, die Sache auf das nächste Level zu hieven!